Rugged leather chaps keep you warm and safe as you ride down the road on your bike. Everything shown here comes in Tall Sizes. Riding a motorcycle is beyond fun. However, every biker has to acknowledge that they could be in an accident. Therefore, they should do what they can to protect themselves. Of course a helmet is the first thing that people think about. This protects their skull. Bikers also have to think about their skin. Leather motorcycle clothing is the best protection that a biker can have to prevent serious scrapes and cuts. Motorcycle chaps protect a biker's legs and lower torso. 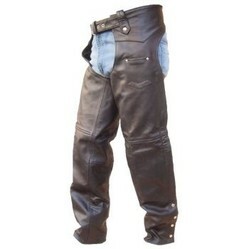 Rugged buffalo or cow leather is the best material that a biker can depend upon for protection. The inseams on these motorcycle chaps vary according to size. On the extra-small motorcycle chaps the inseam is 34.5 inches. On the 5XL the inseam measures 37 inches. You also need to be aware of your thigh circumference as well. On the extra-small, your thigh should be no bigger than 22 inches around. On the 5XL it should be 30 inches or less at it's widest part. The waist belt is 1-3/4 inches wide and the motorcycle chaps are fully lined. Double-stitched for maximum durability. The inseam is two inches longer so it fits both taller men and women. Exterior pockets make it easy to get to stuff when you're riding your motorcycle. Durable buffalo leather will protect you and your clothing, if you have a spill or are in an accident. They will also keep your street clothes cleaner as you fly down the road. I know by first-hand experience how dirty a person can get on a motorcycle. If you love to take your motorcycle off-road, they will protect you from tree branches and bushes that could grab you. While I love riding motorcycles with my husband, I always wish I could bring more along. Learning how to pack leather motorcycle chaps properly keeps the chaps in good condition. It also gives you more room for other things. I mean when we get to where we are going, I like to dress up. This is a great video, if you're chaps are always making your life hard. A leather motorcycle protects your skin, keeps you warm and makes you look great. Here's a great collection of leather motorcycle jackets for tall men.